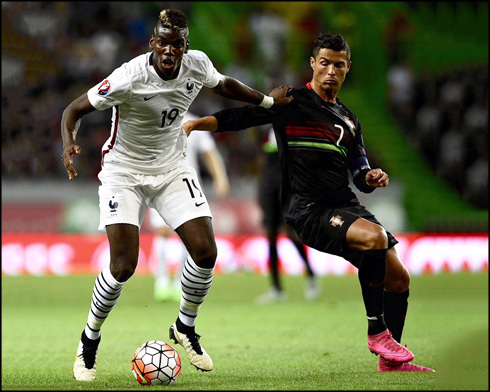 Portugal and France clashed in Lisbon this Friday evening, but just like it had happened in the last 10 encounters between these two nations, it were the French who left the field with a big smile in their faces and another win in the bag! Valbuena had the honor of scoring the visitors' winning goal through a superb free-kick already inside the last 5 minutes of the game. Fernando Santos lined up an experimental midfield in this Friday's friendly against France and we can't really say things played out as he probably had intended. Portugal got beaten 0-1 by France, with the decisive blow only being landed in the 85th minute, when Mathieu Valbuena stunned everyone at the José Alvalade stadium by scoring a perfect free-kick. With an important qualifier for the EURO 2016 against Albania already scheduled for next Monday, the Portuguese coach naturally preferred to be cautious about some of his players' fitness levels and was keen to spare Cristiano Ronaldo from playing the whole match. The Real Madrid star played the entire first half and roughly 20 minutes in the second half, just before leaving the pitch to be substituted by Besiktas' winger, Ricardo Quaresma. With several usual choices unavailable to give their contribute this last night against France, Fernando Santos had no other choice but to reinvent his midfield. 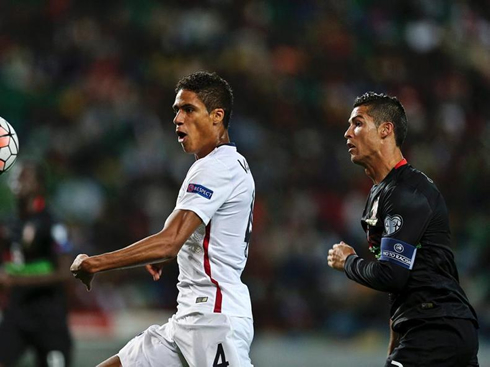 João Moutinho, William Carvalho, Tiago and Fábio Coentrão were all sidelined for this fixture, leaving Danilo, João Mário and Adrién with a golden opportunity to finally play for their country as starters. 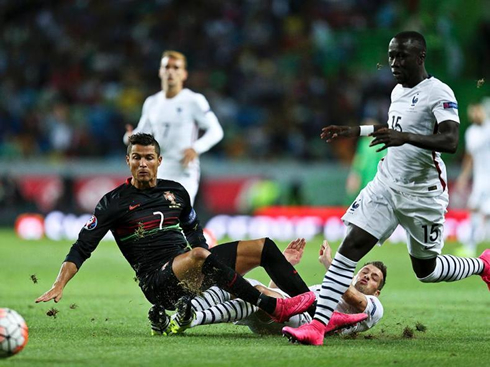 The challenge wasn't going to be easy though, as France came to Lisbon with a very strong starting eleven. It was an even game on the pitch from a ball possession perspective, with both sides splitting it 50/50. However and while France did manage to hit the target in 8 different occasions, Portugal only did it once, when a Cristiano Ronaldo free-kick got stopped by Lloris' very reliable hands. With these stats in mind, it's not that hard to understand why the Portuguese goalkeeper Rui Patrício ended up being one of the best players on the pitch. The Sporting CP goalie made several good saves and truth be told, he delayed the French goal as much as he could. Rui Patrício and Portugal's hopes of a clean sheet lasted close to 85 minutes, but they would succumb in a flash of a second following a foul just a few meters outside the hosts's penalty box, drawn by Atletico Madrid's talented forward Antoine Griezmann. It would be the "little" Mathieu Valbuena stepping up in order to have a go at it and the visitors couldn't have picked a better man for the job. Valbuena curled the ball perfectly over the wall and outside Patrício's reach, making it 0-1 for France. There was not much time left to be played and the final whistle came in shortly after without the Portuguese National Team creating any decent opportunity to equalize the game. Next Monday, Ronaldo and the "Selecção" will play again, this time for the European Championship Qualifiers, against Albania. Attackers: Nani, Cristiano Ronaldo, Éder. 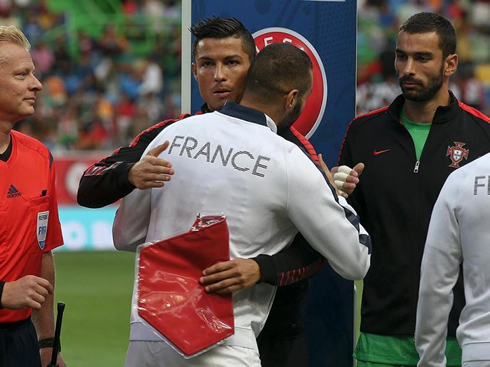 Cristiano Ronaldo next game will be for Portugal, on the 7th of September of 2015, against Albania. You can watch Juventus live stream, Albania vs Portugal, Spain vs Slovakia, San Marino vs England, USA vs Peru, and Argentina vs Bolivia, all matches provided from our football streaming game pages.